Herbert Clay Scurlock was a biochemist who pioneered the application of radiation therapy for the treatment of cancer and the use of x-ray to diagnose dental problems. He was a professor of physiological chemistry at Howard University, where he served on the medical faculty for forty years. Born in Fayetteville, North Carolina, he was graduated from Livingstone College in Salisbury, North Carolina, with an A.B. in 1895. 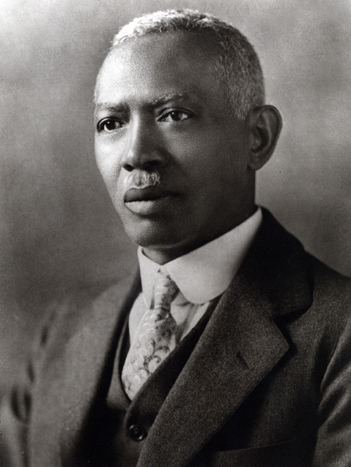 He earned a medical degree from Howard University in 1900 and a master of arts from Columbia University in 1915. From 1900 to 1905, Dr. Scurlock served as an assistant in chemistry and a lecturer in X-ray and electrotherapy at Howard University’s College of Medicine. He then temporarily took charge of chemistry and physics at Howard’s College of Liberal Arts before returning to the College of Medicine as a full professor and head of the department of physiological chemistry. Dr. Scurlock was a member of the Medico-Chirurgical Society of the District of Columbia and served as its president in 1916. He was also a member of the American Chemical Society, the American Association for the Advancement of Science, and the National Medical Association. His textbook Quantitative Chemical Analysis, published in 1915, is available at the Library of Congress. Dr. Scurlock’s brother, Addison N. Scurlock, made this portrait. Addison Scurlock was a prominent social photographer whose career began in the early 1900s and spanned more than six decades. Addison Scurlock’s Washington, D.C., studio was a center for documenting the intellectual and cultural life of African Americans in the nation’s capital. His camera focused on educators, artists, scientists, musicians, politicians, and, of course, on the general populace. Addison Scurlock’s sons, Robert and George Scurlock, continued the work of the Scurlock Studio until 1994.